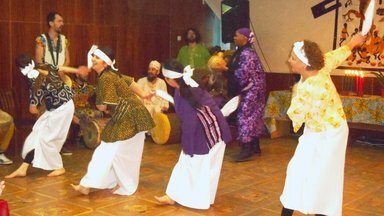 A former dancer and choreographer from Harlem initiated an African dance class at the public library of her host community. 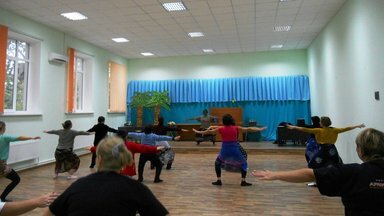 When I first proposed to teach an African Dance class at the library in Causeni, Moldova, where I serve as a Peace Corps volunteer, my partner and the library director both looked at me like I was crazy. But they took a chance on my idea, hoping to attract more local adults to their facility, which was under-used despite having many resources, large spaces and great technology. It’s worked out better than they or I ever expected. Many women from the town showed interest in learning a new dance style. 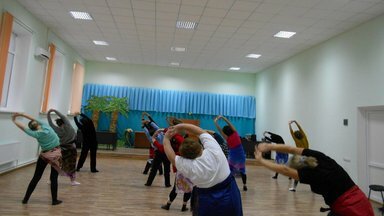 I encouraged my partners to take the class, too, so they could learn how to teach a community dance class, which is very popular in the States. I wanted them to see for themselves how to welcome participants at all levels. What turned out to be even more important was that women in the community came to see the library director as an accessible person they could bond with. I was excited and anxious when the first day of African Dance class finally arrived. I hoped at least a few people would show up out of curiosity, given how intrigued they were by the novelty of an African American woman living in Causeni. Their stares, requests to take pictures and touching my hair had become a daily routine. The class would take place in the library’s salon room on the first floor. As I walked down the stairs, I imagined how lonely this large room would look with two or three people. When I slowly opened the door, there were approximately 50 women dressed in beautifully colored fabric, barefoot, ready to dance and applauding me as I entered. They were giving me more than they realized. I had worked professionally for many years in New York as a dancer and choreographer. During our Peace Corps training, however, I told my new colleagues I did not want to teach dance any more. I was retiring from this career that had enveloped me since I was a child. Now, though, as I witnessed the freedom, joy and light of these women dancing and having a safe space to freely move their bodies, my spirit was renewed. Here in Moldova, so far from my home in Harlem, I had found an opportunity to teach in a new way, with joy in my heart. More than six months have passed since that first class. The women continue to come consistently and have begun using other resources in the library, The class is providing exercise, a healthy lifestyle, new bonds and weekly fellowship for women in our community. It’s also being used as a fundraiser. Each week the women make a small monetary donation towards purchasing an air conditioner and water cooler for the library. I have trained two assistants to teach the class in my absence. From the class we have formed a small dance ensemble to travel and perform at events in other villages, together with a group of Moldovan/African drummers from the capital city, Chișinău. These women walked into our dance class as professors, lawyers, social workers, housewives and mothers. Now they are my sisters, moving together in spirit. They have become the African dancers from Causeni, Moldova. True Spirit Movers. Anne Reid is a Peace Corps Moldova Volunteer in the Community and Organizational Development Program, serving since 2016 in the central part of Moldova.